As you can gather for the posts over the last year, I love to travel. Whether it be a long haul to exotic lands, or European weekend getaways or UK exploring, I love an adventure! My bank account not so much. Beginning of this month, with two friends we boarded a nice cheap airline plane and flew off to Madrid for a couple of days for lets face it a food fuelled getaway. And oh my, we were in the centre of it all. 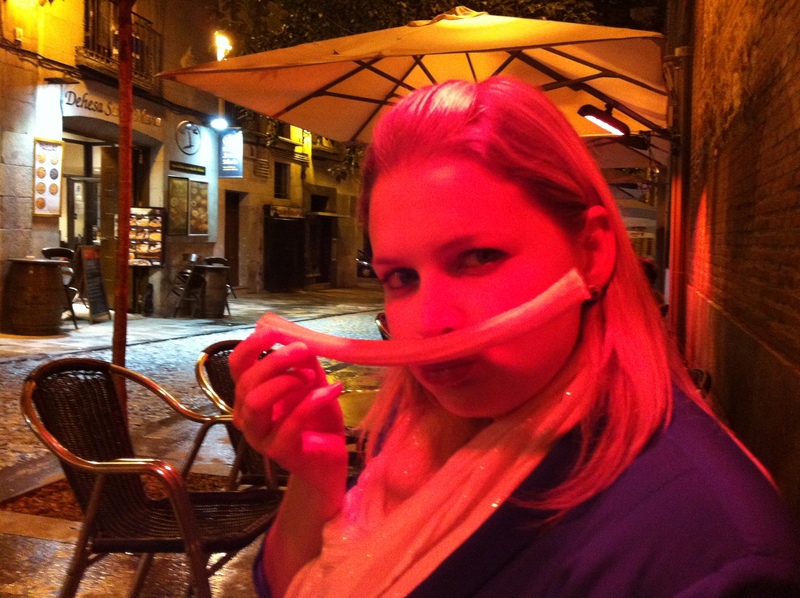 Staying at an amazing apartment in Puerta del Sol, with many foodie treats to be discovered. One place we stumbled on and it was just from my morbid curiosity, seeing a mound of purple flesh through a steamed up window did we find La Pulpería de Victoria , an octopus restaurant! I’m not massively a fish/seafood kind of gal – but thought why not. 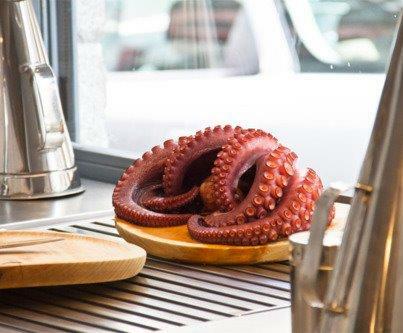 To go to an octopus restaurant and not have an octopus would be pretty shameful. 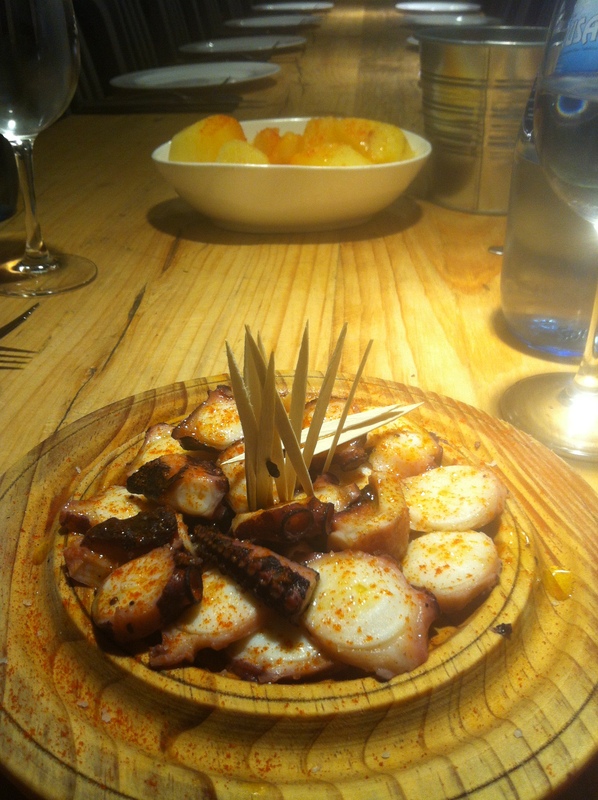 Cooked perfectly and lightly marinaded so not to detract for the ocean flavour of the octopus. It has now made me want to eat all the way through the cast of The Little Mermaid. 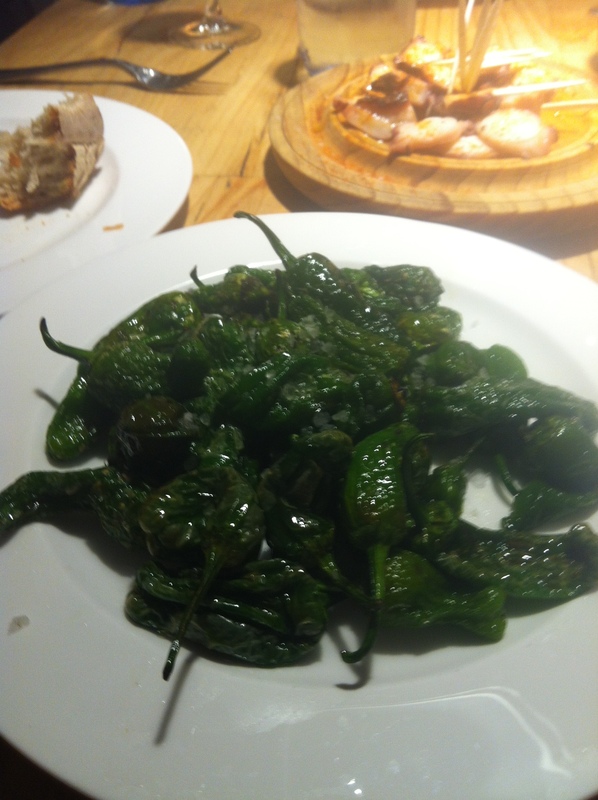 We went for a great mixture of the tapas from the menu including a chicken empanada with red pepper, wonderful golden ham and cheese croquetas, Los pimientos de Padron (little green peppers roasted and salted, 1 out 10 are spicy, the rest sweet from being roasted – love Pepper Russian Roulette!) 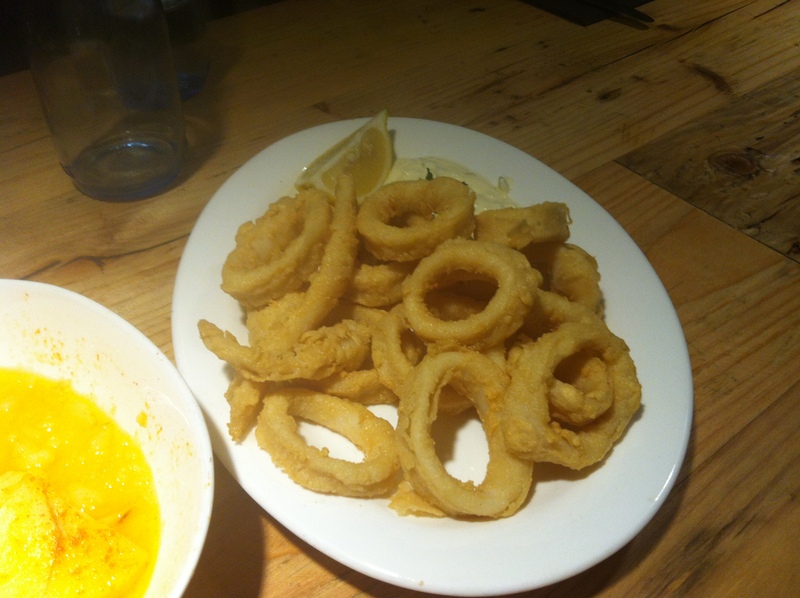 and calamari in light thin batter with aioli. An absolute feast before waddling to the ballet. 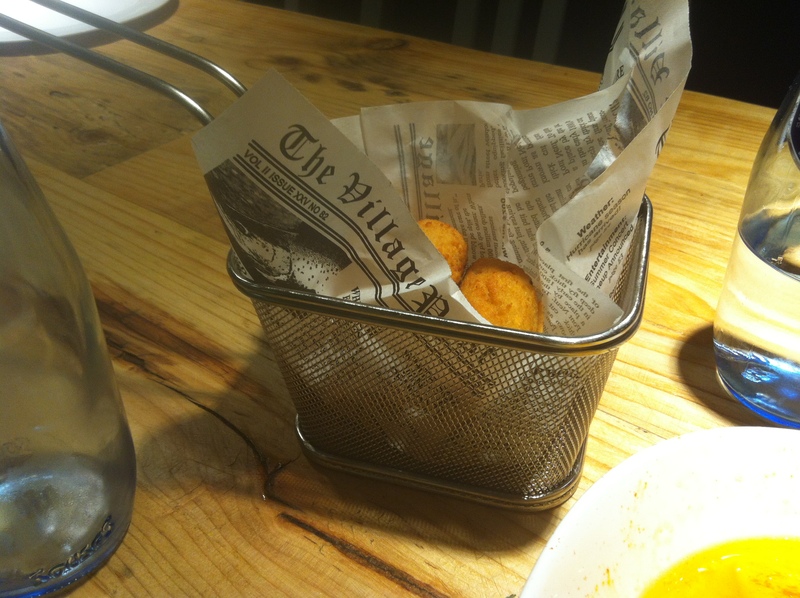 The quality of the food was amazing and some of the best tapas we tried in Madrid. 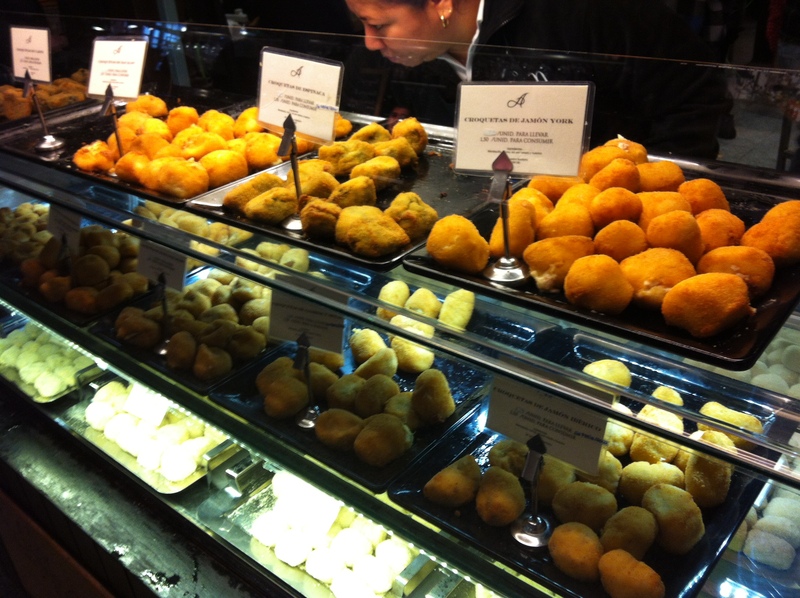 Oh how I love thee croquetas! 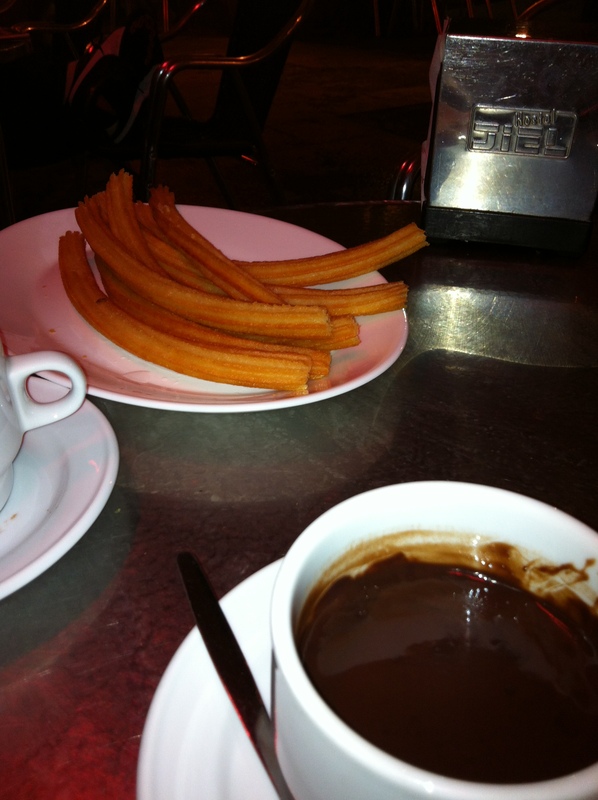 After the ballet, we tried a Madrid institution Chocolateria San Gines. 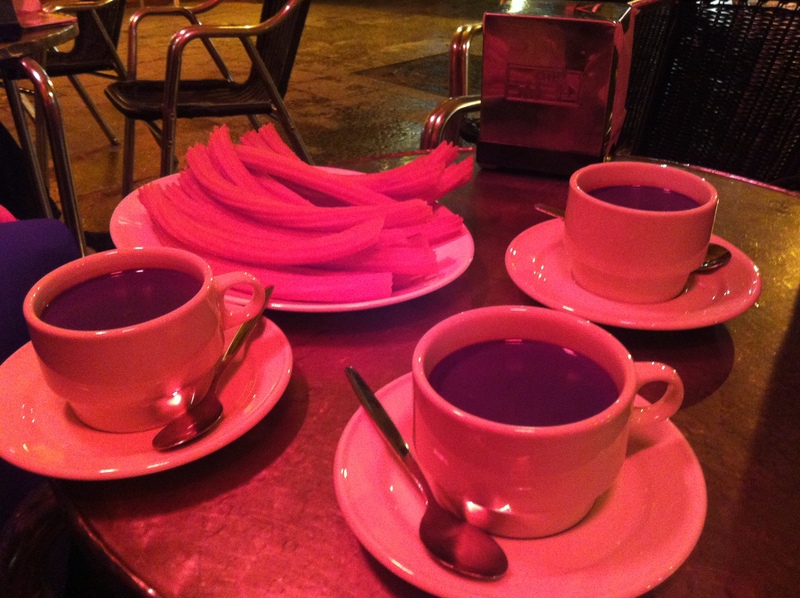 The best to get churros and hot chocolate after a hard night of partying. If you aren’t aware of what churros are, they are a dough that has been fried, like a long thin doughnut, sometimes coated in sugar and must be dunked in thick rich hot chocolate. We had a mountain of churros between the three of us and silence fell upon the table. Sorry for the slightly Red Light District feel to the pictures, they had their warmers on which gave off a lovely red glow! But appropriate for how naughty they were…. They were heavenly and exactly what we needed for a sweet treat. Amazing. 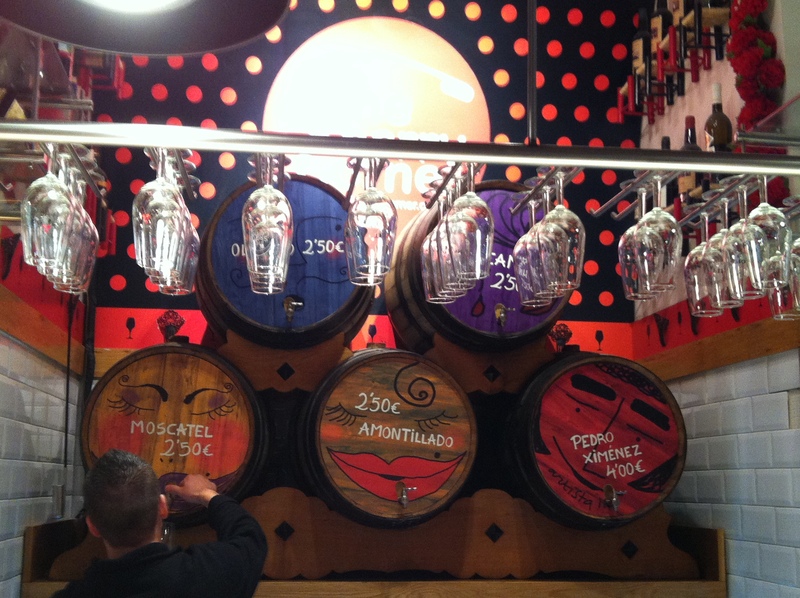 Another must try foodie place we visited was Mercado de San Miguel. A stone throw from our flat and just a foodie gem. I think it is how Borough market in London should aim to be like. Pulling in locals and tourists, the standard of the market is incredibly high. Neat, smart signs and stalls display a wide range of treats that will appeal to everyone. 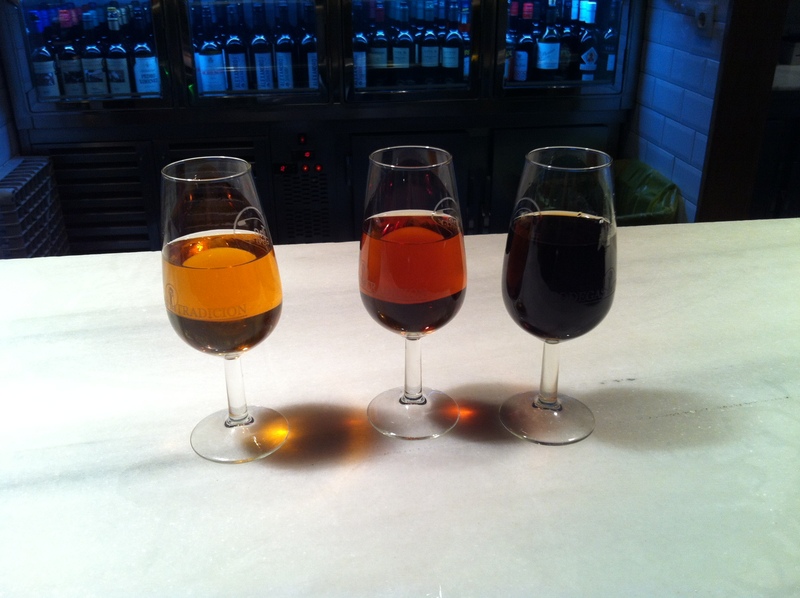 We started with a Sunday midday glass of sherry we went for three different types to try spending maximum of 3 euros a glass. They were so different and luckily there was no fighting as the three of us liked different ones. There was rich caramel flavours and dense sticky toffee pudding notes and surprisingly my favourite a drier fino sherry that had a chocolate aroma without overpowering your senses too much. We took it in turns to scout out the tapas and produce and bringing back for the other two a dish that looked interesting. We feasted on jambon stuffed green olives, countless croquetas – some being flavoured with truffle, chorizo or jambon, burrata cheese (mozerella whipped into double cream- dreamy with pesto), Canary potatoes with mojo sauce, veal steaks grilled to juicy perfection. The list goes on! We loved it so much we actually went back there for our evening meal when we couldn’t find anywhere that took our fancy but traded the sherry for a glass or two of prosecco. 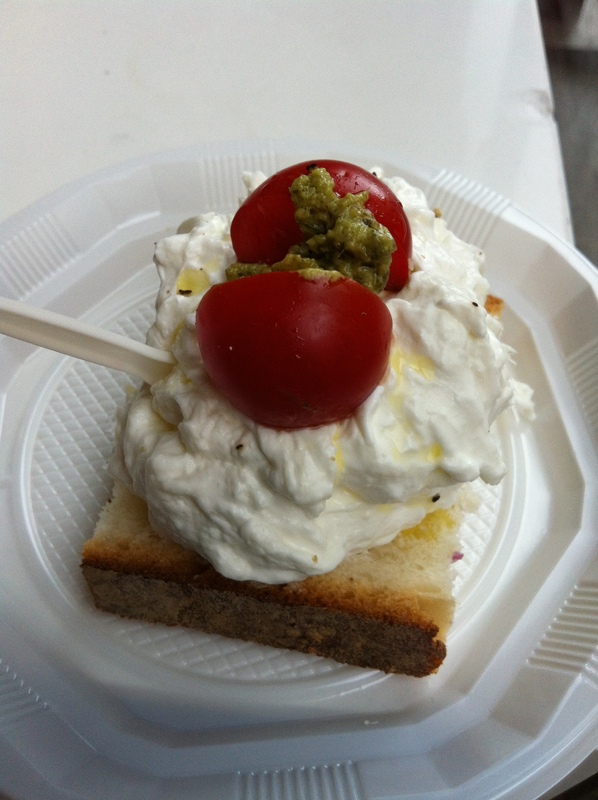 The prices vary, we had dinner with prosecco for 15 euros a head and ate like kings. Depends what you go for the veal was around 10 euros a portion but was split three ways and 4 tasty croquetas for 5 euros, but you could easily go mad here! I had a great time in Madrid and loved roaming the small streets and very happy with the quality and quantity of the food! Super holiday.